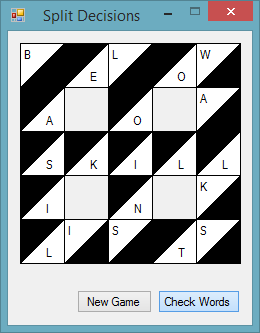 Split Decisions is a word game played in a grid with twenty one split cells. Each cell presents you with a choice of 2 letters. To win the game, you need to select the correct letter in each split cell, spelling out the six hidden words. This is another example of a simply implemented winforms game.